Joss Whedon is busy finishing up Justice League and getting it in the best shape possible in order to hit the November 17 release date. Zack Snyder had to step away following a personal tragedy and it has been undergoing reshoots ever since. This movie is going to have to accomplish a lot, especially since Aquaman, Cyborg and The Flash have had very little screen time to speak of in the DC Extended Universe thus far. However, it looks like Justice League is going to find time to give The Flash some backstory, as teased in a new promo for the movie. The official Justice League Twitter account recently shared a gif of The Flash from the trailer that shows him using his speedster abilities. Since there hasn't been a solo Flash movie yet, his origin hasn't been explored, but based on the caption provided, it sounds like we may at least get a glimpse of that origin story in Justice League. "After an electric storm, Barry Allen was never the same. #JusticeLeague"
Aquaman comes out next year, so he is going to get plenty of screen time following Justice League. Vic Stone/Cyborg and Barry Allen/The Flash are a little more up in the air right now, so showing off a bit more of their origin stories in this movie would actually make a good bit of sense. As teased by the caption, Barry Allen got his powers during a lightning storm and it wouldn't be too difficult to show this, even briefly, in the movie. Granted, there is going to be a whole lot going on, so it is going to be tough to not clutter things up. In Justice League, Bruce Wayne is fueled by his restored faith in humanity and inspired by Superman's sacrifice at the end of Batman V. Superman: Dawn of Justice. He enlists the help of his newfound ally, Diana Prince, aka Wonder Woman, to face an even greater enemy; Darkseid's second in command, Steppenwolf. Together, they quickly to find and recruit a team of metahumans to stand against this newly awakened threat. But despite the formation of this unprecedented league of heroes, Batman, Wonder Woman, Aquaman, Cyborg and The Flash may already be too late to save the planet from Steppenwolf's assault. During San Diego Comic-Con, it was revealed that the trouble Flash solo movie is actually going to be titled Flashpoint. That is one of the most important storylines in the history of DC Comics, but it is most certainly not an origin story. 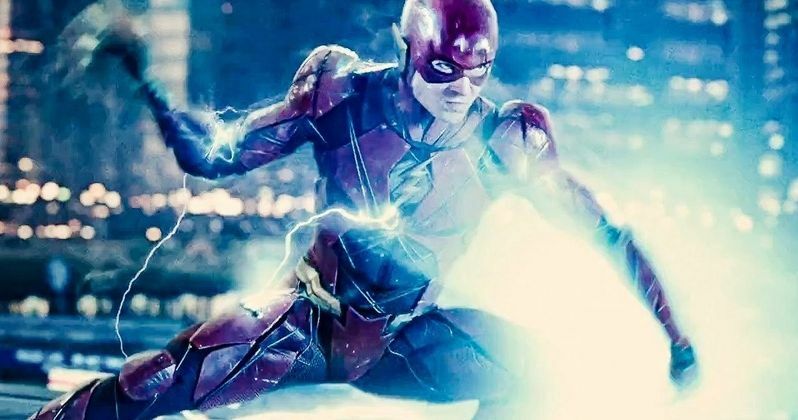 In fact, Flashpoint was used to reset the DC universe at the time and takes place in an alternate reality, so there probably won't be any time to dance around Barry's early days in that movie. The DCEU is going to have to accomplish that elsewhere, and Justice League seems like the most logical place to get it done. Be sure to check out the promo for yourself below.